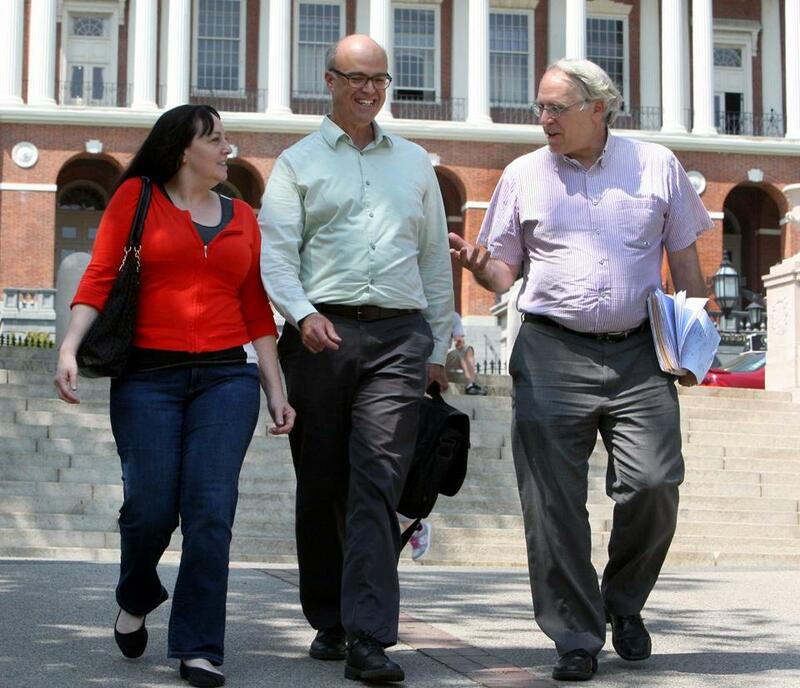 From left: Deb Fastino, Harris Gruman, and Lew Finfer are the founders of Raise Up Massachusetts, the group backing a "millionaires tax" in Massachusetts. Five powerful business groups on Tuesday filed a legal challenge with the state Supreme Judicial Court aimed at blocking a 2018 ballot question that would impose an added tax on the state’s highest earners. Under the union-backed ballot measure, Massachusetts residents would pay a 4 percentage point surcharge on earnings of more than $1 million a year, on top of the state’s personal income tax, currently 5.1 percent. The additional tax money — estimated at $2 billion annually — would be earmarked for spending on transportation and education. Business groups have emerged as leading opponents to the proposed surcharge, known as the Fair Share Amendment. They say it could chase away employers and undermine the progress toward making the state a more friendly place to do business. In the lawsuit, the groups focus on legal arguments that they believe show the ballot initiative is unconstitutional. First, the business groups say, the question improperly links unrelated subjects: a graduated income tax and spending on transportation and education. Second, they maintain that by dictating how extra tax revenue must be allocated, the initiative limits the Legislature’s ability to decide on spending, violating a state constitutional prohibition on making “specific appropriations” by initiative petition. Finally, the groups argue that initiative petitions should not be used to take taxation authority away from the Legislature. Chris Anderson, president of the Massachusetts High Technology Council, said he expects that the high court will hold oral arguments on the case by early next year, with a decision likely sometime in the spring. “If I were voting on something, I would want to make sure the courts have already reviewed that what I’m voting on is actually constitutional,” said Anderson, one of the plaintiffs. The other groups represented in the suit are the National Federation of Independent Business, Associated Industries of Massachusetts, the Massachusetts Taxpayers Foundation, and the Massachusetts Competitive Partnership. They are suing Attorney General Maura Healey to overturn her office’s certification of the ballot question and Secretary of State William Galvin to block his office from placing the measure on the ballot in November 2018. The Raise Up Massachusetts coalition — which is largely union-funded but also includes community and religious groups — is pushing the ballot measure as a constitutional amendment. The state’s constitution does not now allow for a graduated income tax such as the proposed surcharge on top earners. The coalition is also championing two other ballot questions for the 2018 elections that aim to change state law but not its constitution. One is a mandate for paid family leave; the other is a requirement to raise the minimum wage to $15 an hour. If the business groups can’t persuade the court to block the so-called millionaires tax, both sides will likely wage costly campaigns to win over voters during the 2018 election season. Anderson, of the high tech council, cited the corporate exodus under way in Connecticut — in the last two years, General Electric, Aetna, and Alexion Pharmaceuticals all decided to move their headquarters out of that state — and called it a warning for Massachusetts. But University of Massachusetts Dartmouth public policy professor Michael Goodman said the tax on high earners would likely be a plus for the state’s economy. He said research has shown that added taxes on top earners don’t generally cause them to move elsewhere. The benefits — new money for schools, roads, and trains — would outweigh the costs, he said. Correction: An earlier version of this story did not specify that the ballot question would impose a 4 percentage point surcharge only on earnings above $1 million. Earnings under $1 million would be taxed at the current 5.1 percent rate.